Today I have something a little bit special for you. 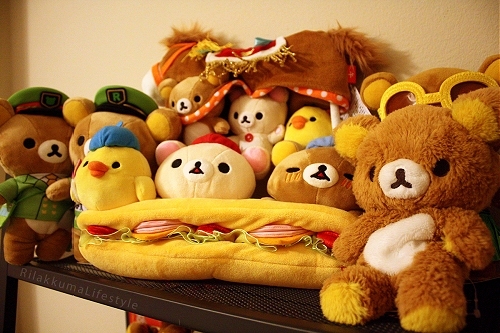 Faith, from Rilakkuma Lifestyle has agreed to share a little of her amazing Rilakkuma collection with you. I stumbled across Faith’s blog several months ago and have been oohing and ahhing over her Rilakkuma plushies ever since. 1. 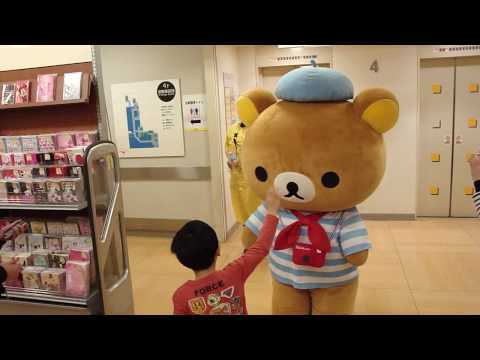 How did you first discover Rilakkuma? Since I was so stressed out with my schoolwork back then, seeing Rilakkuma so relaxed and happy was just what I needed to push through my final paper! Afterwards, I asked my sister to get me a Rilakkuma plushie as a graduation gift and I’ve been obsessed ever since! 2. 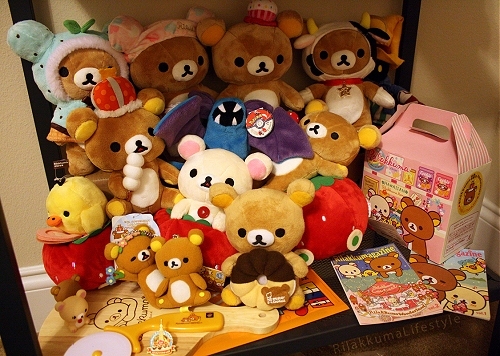 When did you start collecting Rilakkuma? For the first few months, my first Rilakkuma plushie was the only one I had! I didn’t know there was a whole world of Rilakkuma plushies out there yet, so it actually wasn’t until my family went to Maido (a San-X carrier in San Francisco) in the summer of 2012 that I started looking more into the different Rilakkuma designs and collectible plushies. It was actually my older brother who purchased the first collectible 22cm Rilakkuma plushie – a handsome Marine Series Rilakkuma! After that, I started doing more and more research on Rilakkuma plushie history and authenticity. 3. What is the main focus of your collection? 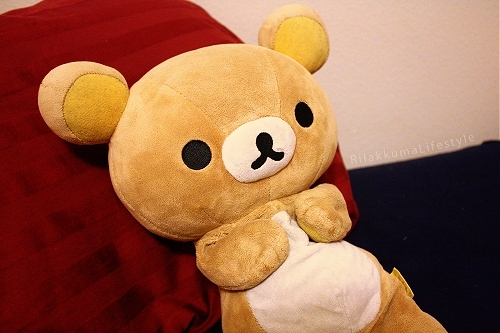 Though I do have other Rilakkuma merchandise like books and pizza cutters, I mainly collect plushies, and generally only the standard 22 cm size – but even then, I am rather picky about which plushies to get, so I don’t try to buy every Rilakkuma series out there, just the ones I’m really drawn to. A lot of readers have noticed that many of my Rilakkumas are food related haha, so I suppose that’s a focus of mine too. What can I say? Rilakkuma loves to eat just like me! Most recently, I’ve been really interested in getting the older series that were released before I even knew who Rilakkuma was, such as the Bonjour Series! Also, I really love getting the special editions like the Rilakkuma Store Exclusives/Anniversaries and Caravan designs, but I do think each plushie is lovely in its own way! I really love collaboration items too, such as the Mister Donut, Yamanote line, and Lawson plushies. 4. What are your favourite items in your collection? I even take him with me when running errands sometimes (it’s nice to have the company). 5. Do any of the items in your collection hold special meaning or memories for you? Each plushie represents a different part of my life, and each one has its own story! For example, Sandwich Rilakkuma (the Rilakkuma Store Exclusive plushie from the Bonjour Series) was a plushie I had wanted since I first started researching Rilakkuma back in 2012. Since that plushie came out in 2010, it’s pretty difficult to find nowadays. I had to diligently check the Japanese auctions for months before I finally won one for myself – one of my proudest victories! Also, I have 2 plushies from the Yamanote Line x Rilakkuma collaboration: the fan and the stationmaster. These plushies both mean a ton to me not only because riding the Yamanote line was something I clearly remembered from my time in Tokyo, but because I got them from two of my Rilakkuma blogger friends (Liemzie and Rilakkuma Desu). I wouldn’t have been able to get the set so easily without the help of my friends! Of course, the plushies that readers have sent are incredibly meaningful to me since they represent the amazing generosity of the Rilakkuma community! Seeing them in my collection makes me so grateful and humbled to be a part of such a supportive and thoughtful group of people! 6. 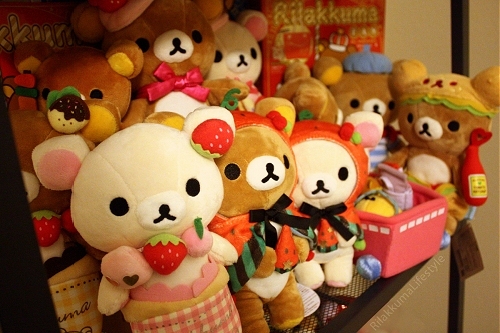 What do you love most about collecting Rilakkuma? The online Rilakkuma community is definitely one of my favourite things about collecting! Everyone is so supportive and encouraging, and it’s amazing to see the love of Rilakkuma bringing so many people from all over the world together – even my family is into Rilakkuma now! Especially since I don’t buy every Rilakkuma plushie, I love looking at other Rilakkuma collections and seeing details of all the different Rilakkuma plushies old and new! And, as always, please pin her super cute Rilakkuma pictures to Pinterest. 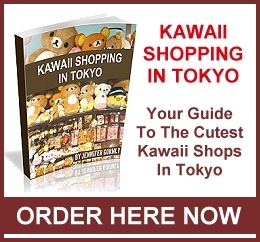 This entry was posted in San-X and tagged Collection, Kawaii, Plushie, Rilakkuma, San-X. Bookmark the permalink. ← Bankan Sweet Lip – Candy Or Cosmetic? 7 Responses to "Faith’s Rilakkuma Plushie Collection"
Loved reading this, thank you for featuring Faith on your blog! Thanks for visiting my blog Richelle. I’m glad you enjoyed Faith’s story. Thanks so much, Jen! It’s been such an honor! Thanks so much for being a part of my blog Faith. I really enjoyed putting this together for you and learning more about your collection. I’m glad you enjoyed it Ariel. Thank you for visiting my blog.